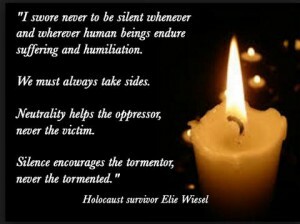 Don’t stand by is the theme for Holocaust Memorial Day 2016. We said “Never Again” but that did nothing to stop genocides in Rwanda, Cambodia, Bosnia or Darfur. We said “Never Forget” but we can’t apply that only to antisemitism when there’s so much discrimination even in our supposedly democratic, free home countries, against people with different skin colours, gender identities, sexual orientations, religions or traditions. We tore down the concentration camps in Europe and made them into museums. But prisoners are still being sent to death camps in places like North Korea. Adolf Hitler has been dead for 70 years, but politicians are still running for office and using minority-baiting and drumming up hate, fear and prejudice in order to gain power. We’ve acknowledged the tragic outcome of saying “none is too many” and yet we still react in fear when desperate refugees from civil wars in places like Syria want to come to our shores. Competing about tragedies (“ours was worse than yours”) only serves to divide us, to pit us against each other and to further build walls between humans. Instead, let’s focus on calling out injustice and persecution wherever we see it. Not just today, but every day. It’s not just about being Jewish. It’s about being human. Wiesel: who will stop the genocide? How exactly is this funny?